Cross the bridge when we get there. At least now we get to "save the date". Yup .. saving the date is more impt .. Registration opens liao. Fastest fingers first. Super Early Bird Registration opens in 5 DAYS! What’s more, the first 8o people to register on 31 October with the code “5ECODEAL” will get an additional $5 off their race entries*! $5 is off whatever rate you are entitled to. Income policy holder pays $37 for HM with code applied. Registration completed at SGD37 with "SGD5 OFF PER PAX. INCOME POLICY HOLDER RATE". Thank you for sharing! Sian. Code is fully redeemed. 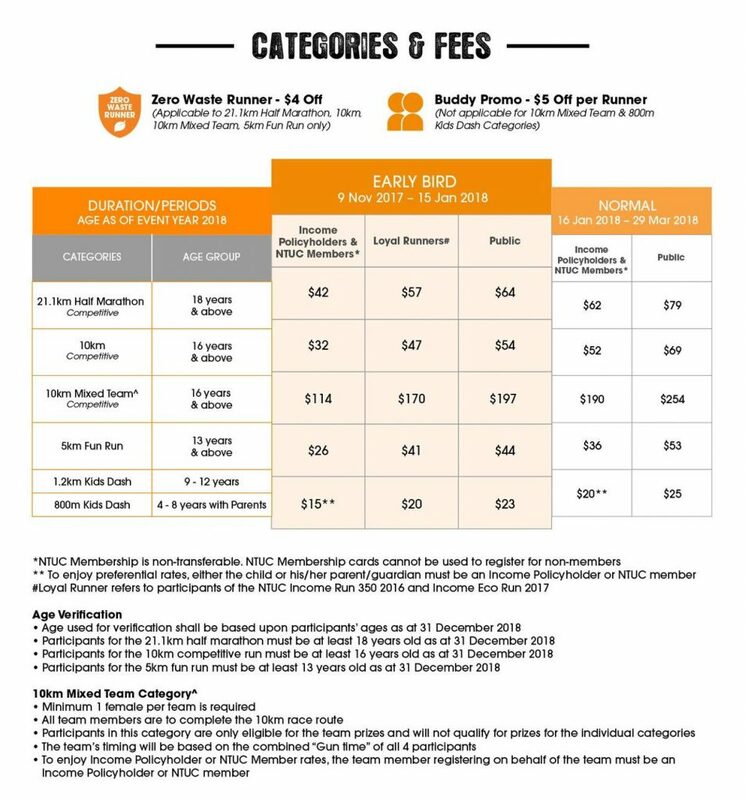 Anyway the rates are more expensive for ActiveSG Members, NTUC Members, PAssion Cardholders & Loyal Runners this year? I remembered paying about $40 last year but this year is $50+. Maybe there was a promotion for PAssion Cardholders last year or something. Where do you get the $45 for 2019? Mine says $57. I am referring to non-policy holders but discounted rates from other clubs (ActiveSG, NTUC, PA etc). Last year PA gave a discounted rate of $40+ but this year is $57. Anyway policy holder rate is also $42 and not $45. $42. When email on registration received this afternoon, boh special discount liao. I registered but I was telling my colleague ealier this afternoon the HM fee is the most expensive I have ever remembered for this event I have supported since Year 1. If not policyholder, I might have skip 2019 and future liao. Agreed. For one of the cheaper HMs out there, the normal rate is quite shocking as compared to previous years. Actually Stalky is right. Policy members paid $42 last year. Meaning there is no price increase this year. Last year's rates below. Can anyone confirm if last year you can use policyholders rate, and both buddy and zero waste runners promo? Which means you only pay $33 for HM. It wasn't really clear. This year it looks like it is possible to use all 3 rates, making it possible to reduce the HM price to $35. Sadly PAssioncard members now pay loyal runners price instead of policyholders price. Oops, clash with London Marathon, which I got a ballot place for. Is it still considered as a streak if I register for this and get someone else run on my behalf with my bib? Haha!